On the sprawling plains of Elysium Planitia, we’ve done it again. For the eighth time in human history, earthlings have landed a spacecraft on Mars. InSight, launched by NASA earlier this year, will probe the deep interior of its rocky home, shedding light on the formation of distant worlds, as well as our own. The robotic lander touched down on the Red Planet on Monday, planting itself on a flat, smooth region straddling the equator. There, it will listen for the inner rumblings of the planet — called, fittingly, marsquakes. 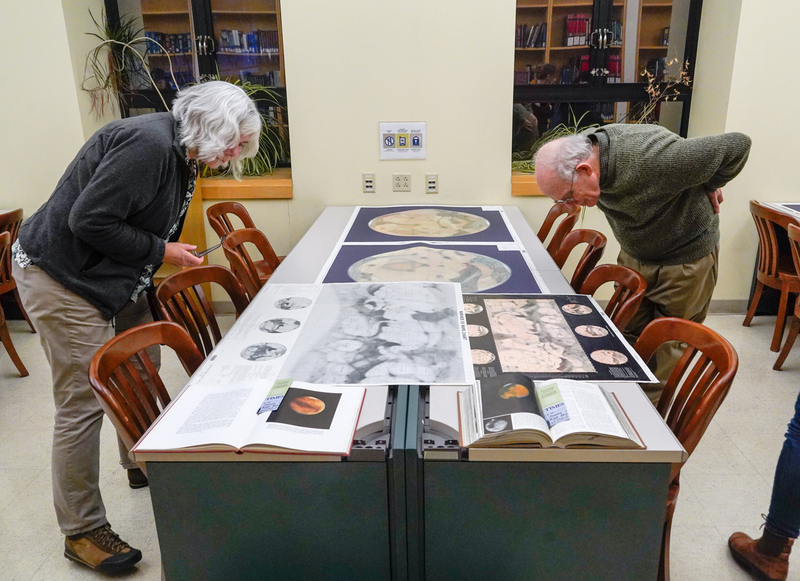 Also this week, the campus’s Earth Sciences and Map Library held a pop-up exhibit called Maps of Mars!, where visitors could explore not only InSight’s territory, but also the thrilling, dynamic landscapes wrapping around the planet. On display were an array of maps of Mars, showing everything from volcanic flow and rock age to the changing distribution of gravity across the planet. “I’m hoping people are in the Mars spirit,” said Sam Teplitzky, Earth and physical sciences librarian, of the fortuitous timing. 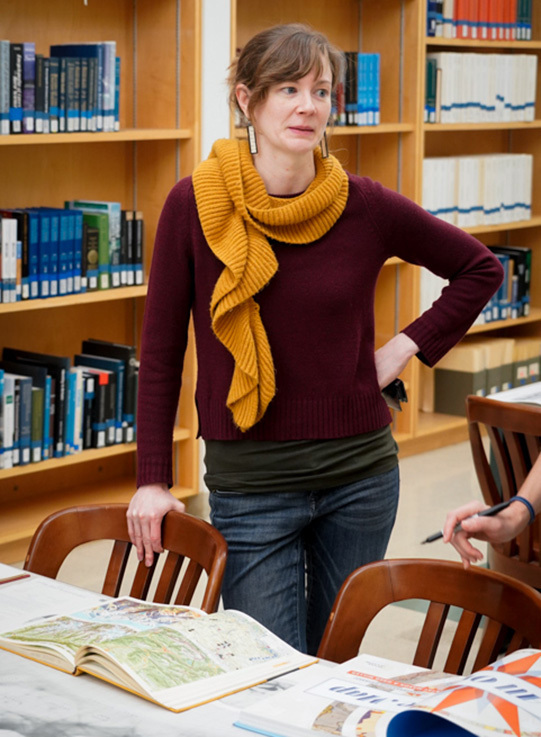 At the pop-up event, guest curator Betsy Mason, a freelance science journalist who writes about maps for National Geographic and recently published the book All Over the Map: A Cartographic Odyssey, walked visitors through the history of humankind’s efforts to visualize Mars on paper. The exhibit was a geological time machine of sorts, offering insights into society’s changing ideas about Mars — and its supposed inhabitants — as seen through our maps. Top to bottom: Clockwise from left: Alicia Cowart, cartography lecturer in the Geography Department, chats with Mason while getting her book signed; colorful maps of Mars were on display; visitors listen to Mason speak. Before the idea of colonizing Mars was a twinkle in Elon Musk’s eye, telescopes first gave us glimpses of the planet 400 years ago, when Galileo Galilei looked to the cosmos and saw Mars’ blank, glowing disk. As telescopes improved over the centuries, astronomers traced their detailed observations on paper, from which a growing body of maps were born. The first real map of Mars, according to Mason, came in 1840, when German astronomers Johann Heinrich von Mädler and Wilhelm Beer plotted what appeared to be permanent geological features of Mars — some of which are accepted as known features on Mars today. Those early maps basically consisted of dark blobs on a white background. Scientists continued to sketch the planet in abstract splotches of black and white over the decades, and in his 1870 book Other Worlds Than Ours, British astronomer Richard Proctor theorized that the light and dark spots drawn by the Rev. W.R. Dawes were, in fact, depictions of land and sea. For the next century, people around the globe believed that Mars, replete with its promised seas, almost certainly sustained life. “Processes are at work out yonder in space which appear utterly useless, a real waste of Nature’s energies, unless, like their correlatives on earth, they subserve the wants of organized beings,” Proctor wrote in his book, on display in Tuesday’s exhibit. In the late 1870s, a new picture of Mars appeared that, to the world, seemed to all but prove that Mars had been harboring intelligent life. Italian astronomer Giovanni Virginio Schiaparelli had drawn in his version of the Red Planet a series of straight lines, which many interpreted as a system of artificial canals built to distribute water from the planet’s melting ice caps. “Which is hard for me to read, as a science journalist,” Mason remarked. The theory would persist, at least in some spheres, until 1969, when NASA’s Mariner missions of 1965 and 1969 produced breathtaking maps showing volcanoes, lava flows, canyons, impact craters, dust storms, and more — but no straight lines. 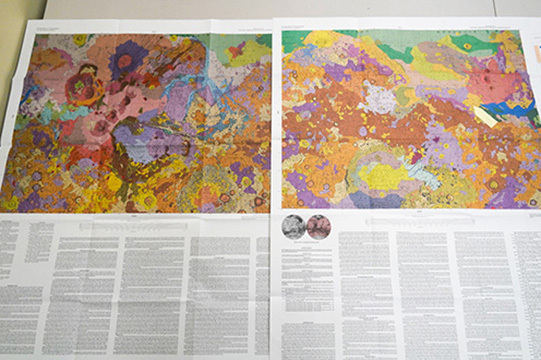 The first geologic map of Mars, based on data from the Mariner 9 mission, was published in 1978 by the U.S. Geological Survey. It is a stunning mosaic of color, also held by the library. 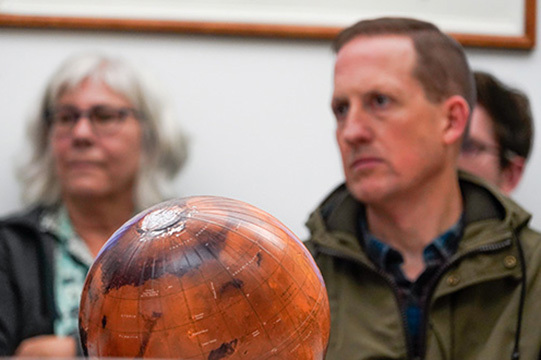 Attendees, including Phil O'Brien, right, get a look at old and new maps of Mars at the event. On one visit, Mason was struck by a series of giant maps of Mars produced by the U.S. Army Corps of Engineers in 1971. In all her research, she had never seen those maps before. The exhibit also featured more recent maps of Mars, including a 2016 depiction by NASA of Mars’ gravity, based on the changing orbits of nearby objects, and a 2014 map based on data and studies from NASA’s Viking missions of the 1980s and onward. Phil O’Brien, a community member, was drawn to the event because of his former career as a U.S. Air Force officer who planned global air operations using maps. He's been studying maps and charts since 1969, he said. 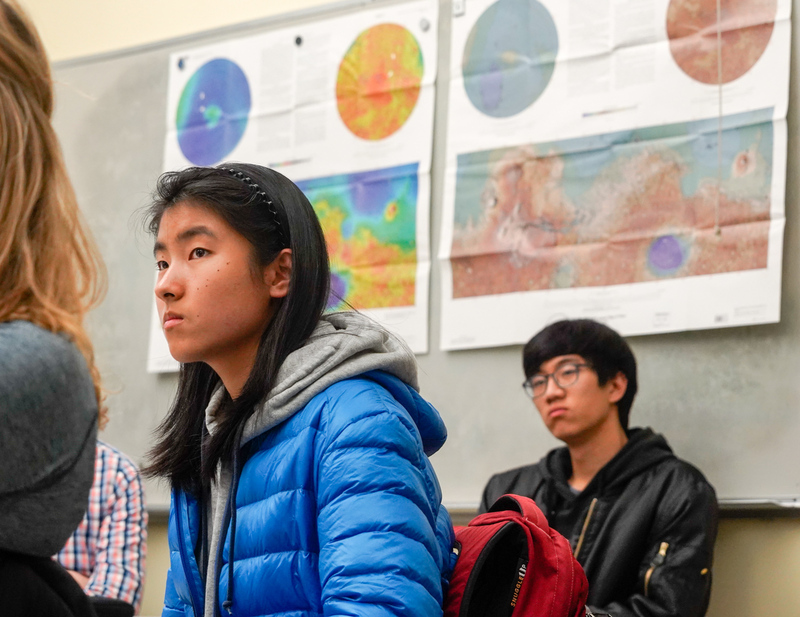 Curating the exhibit and digging through the library’s trove of maps was like being a kid in a candy store, said Mason, who has been writing about maps for five years. Before becoming a science journalist, Mason was a geologist. “I love maps for so many reasons, and I love different maps for different reasons,” she said.